Overnight, a man in his 60's was killed trying to catch a city bus on South King Street. Police say it appears he was trying to chase down the bus and somehow fell under the rear wheels as it was pulling away. We're gathering details and will have those for you on Sunrise starting at 4:30. Those three Canadian visitors sailing to Hilo from Mexico who lost their sailboat mast and had to be rescued have just arrived in Honolulu on a container ship. We were there as the father, his brother, and his 9 year old son came off the Horizon Reliance cargo ship that was called in by the Coast Guard to assist. The sailors ran into trouble nearly 280 miles northeast of Hilo. Family and friends from the Big Island were there to greet the rescued sailors. Ramsay Wharton is covering their arrival and will bring us live reports. See more on their ordeal here. High surf warning is posted through 6 tonight for most northwest shores. 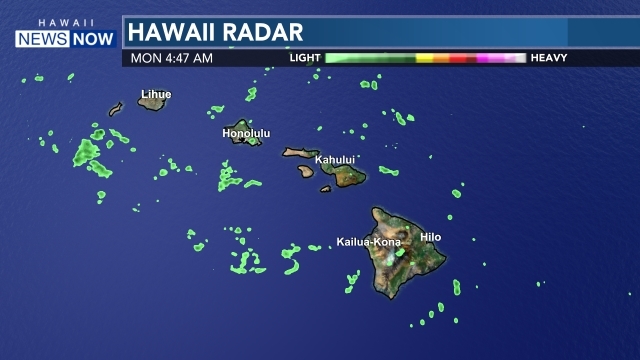 There's also a wind advisory for the summits of Mauna Kea and Mauna Loa. Breezy northerly winds bring us chilly overnight temperatures. Dan says temperatures will max out in the mid 70s but feel even cooler. Investigators will be back on the scene of a large fire that hit two homes in the Salt Lake area. They're looking for sparks that caused an estimated half a million dollars in damage. Happening tonight, West Oahu residents worried about the closure of Hawaii Medical Center can attend a town hall meeting. There will also be an update on possible new parties to re-open the hospitals. The meeting will start at 7 tonight at the Kapolei Middle School dining room. Representative Kymberly Pine and Senate Health Committee Chair Chair Josh Green sat down with Sunrise yesterday to talk about options being considered to reopen the hospital. You can watch that segment here. The remains of HPD officer Garret Davis are back in California this morning for his burial. His family plans to hold funeral services in Sacramento this weekend. Yesterday, Honolulu police bid a final aloha to Davis, who was killed in a freeway crash last month. You can view a slideshow of their emotional salute to their fallen brother on our website. Starting Monday, we are giving out a "Diamond a Day" on Sunrise! We started accepting entries yesterday, but we apologize for all of the T-mobile users who couldn't send a text message so we've expanded the ways you can enter. You can text the phrase "sunrise luv" to 56376 or enter by clicking the Diamond a Day tab on the left side of our facebook page to enter online. You'll be qualified to win a pair of tickets to see Neil Diamond in concert at the Blaisdell and our grand prize, a "Hearts on Fire" diamond pendant. The Sunrise Slimdown teams met up for an ultimate frisbee Showdown that was anything but ultimate. See highlights of our battle and why I'm so bitter at 7:10. Hope you can join us for Sunrise!